From the time he was in fourth grade at Harris School until his junior year at South, Ben Van Dusen collaborated with his father Jack on the design and construction of the model solar system that extends along Eugene's riverbank bike paths from a 4.5-foot diameter Sun in Alton Baker Park to a one-tenth-inch Pluto 3.7 miles away. 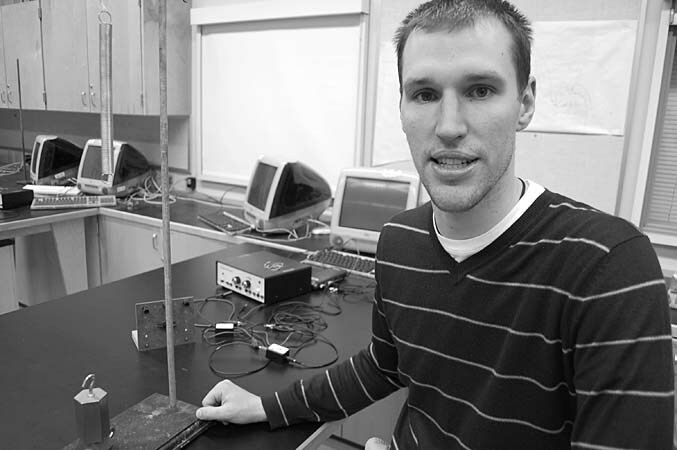 Van Dusen left town for a degree in physics from UC Berkeley, but returned for a master's in education, then a job teaching physics at his old school, South Eugene. "This is the room where I was inspired to do physics," he says. "John Hocken was my physics teacher junior year." After two years at South, Van Dusen was the youngest ever elected as faculty vice president (and president the following year). He also does research in Richard Taylor's physics lab at the UO. "I'll have three publications this year," he notes. "We found connections with M. C. Escher's art work, using mirrors and light to model chaos in nano-electronics." In September, Van Dusen will leave for a year in DC as one of 15 teachers nationwide chosen as Einstein Fellows. "I'll be working with the National Science Foundation," he says, "looking at grants they've given and how they apply to K-12 education."